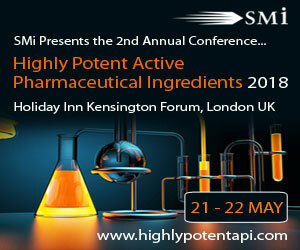 SMi’s 2nd annual conference and workshops on Highly Potent Active Pharmaceutical Ingredients will be taking place in London UK, between the 21st – 23rd May 2018. There is still time to register online, with special rates available. Hear from the speakers themselves, who will be presenting key topics and issues within highly potent apis, especially discussing the future of cross contamination issues. Dep. Head of Drug Substance Development Division | Developing chemical engineer | Development Scientist | Director of Containment & Micronisation | Director of Operations | EHS Director | EHS Manager | Executive | Head of EHS | Head of Manufacturing | Health, Safety Environment | Managing Director | Occupational Hygiene Manager | Principle Scientist | Principal Occupational Hygienist | Principal Scientist Drug Substance Development | Production Manager | Sales Manager | Scale Up Chemist | Senior Lab Techniciton | Senior Research Technician +more!